DCEmu Homebrew, Hacking, Emulation, Gaming and Theme Park News. - DCEmu Reviews is your source for PlayStation 3, PS3, Xbox 360, Wii, GameCube, PSP Go, NGP, DS Lite, DSi, 3DS and PC video game news, reviews and more! Overview : Many PS3™ shooting games do not give you the option to use L2 and R2 to aim and fire. But why be forced to use L1 and R1 to aim and fire if you're not comfortable with that controller setup? XCM Swapper gives you an option to swap those keys to suit your personal gaming preference. Not only can the triggers be swapped to however you want, but you can also swap any button (except PS Home button) to any position that you like. The XCM Swapper lets you do swap buttons that games won't allow you to do. Re-enjoy your games. Quality/Usability : Connecting the XCM Swapper is pretty straight forward. Just connect your PS3 controller to the USB port of XCM Re-Mapper. Then plug the XCM Swapper USB plug to the PlayStation 3™ console. First, connect your PS3 controller via USB cable to the USB port on the XCM Swapper. Now, connect the USB cable from the XCM Swapper to the USB port on the PlayStation 3.
a. Press the “P” program button once. The program indicator will light up. The XCM Swapper is now entering programming mode. b. Now press the silver printed word “X" button on the XCM Swapper. The “X” button indicator will light up in red. The program indicator will begin to blink. c. Press the yellow printed word “/\” button and the “/\” button indicator will light up in red. The program indicator will now stop blinking. d. If you want to remap other keys, follow the above steps “b” and “c” until you are done remapping. If you are done with your remapping of buttons, finally press the program button “P” once. All the indicator lights will turn off and this will exit the programming mode. Now you have the new setting included from the above steps; pressing the “X” key = “/\” key. Note: the PS Home key can not be programmed. (2). Swapping the Left and Right analog sticks. Press the program button “P” and the program indicator will light up. Push the Left or Right analog stick in any direction and the program indicator lights will turn off. The functions of these 2 analog sticks are now swapped. If this step is repeated again, the function of these 2 analog sticks will revert back to its default function. This swap procedure does not change the function of the RC and LC key. The UP, DOWN, LEFT and RIGHT directions on the analog stick can not be swapped. This only swaps analog sticks. Left analog stick will now be where the Right analog stick is and the Right analog stick will be where the Left analog stick. (3). Display the programmed buttons. By pressing on the program button “P”, some of the programmed buttons will be light up in red. On the XCM Swapper, press the program button “P” again to exit out of programming mode. If you set the “L2” key to the “R2” key, “O" key to the “X” key, when pressing on the program button “P”, the yellow printed words “L2”, “O” and the silver printed words “R2”, “X”, will all be light up. (4). How to clear the settings. a. If you want to clear a single setting, for instance: you had set “/\" key to replace the “X" key, press the program button “P” once. The silver printed word “X”, yellow printed word “/\” and program indicator will all be light up in red. Now press the silver printed word “X” program button once. The program indicator will begin to blink, Press the silver printed “X” program button again and the program indicator will stay red. The silver printed word “X” and yellow printed word “/\” indicator will be off. Finally press the program button “P” to exit the programming mode. b. To clear all the swapped settings, simply press and hold the program button “P” until the program indicator starts to blink. Release the button and the program indicator lights will turn off after 3 seconds. All the swapped setting are now cleared and reverted back to default settings. More details and even pictures is now available for the E3 FLASHER! We even have video too. E3 Flasher = The world's first Dual-Boot, with simple 1 key operation = Surprising Arrival! Compatiable all device like PS3/WII/XBOX360/MP3/DVD/BD/MP4/Table PC which has NAND or NOR flash memory. Integrated lots of interface, perfectly extension, will have more function with future new E3 accessory. E3 flasher Limited version includes 8 accessory, suggested retail price $88 USD, total production run only 3000 units! You can pre-order yours from LighTake and LighTake (w/ESATA Station). It was only a few days ago that Team E3DIY released a video of their new E3 FLASHER downgrading a 3.70 firmware to 3.55. Now, we received a video of them dual booting both 3.70 and 3.55 in only a few seconds! E3DIY team success dual boot with E3 FLASHER, you can switch 3.7 and 3.55 in few second ! ALL PS3 PLAYER dream come true : E3 FLASHER help you switch 3.7 and 3.55 freely and fast,only few second ! all is so easy with 1 key operation. E3 company will release all details like picture, installation, operation and price next week. And E3DIY team get another great progress for PS3 with E3 FLASHER, it will release at the same time next week. PS: 4times switch showes same MAC address, to prove it is the same console. As stated, Team E3DIY will release pictures, installation, operation and price next week. We'll have a full review when we get our sample in. UPDATE 9/3: Heard this from another source of mine. Price is $88-108 and there will be two versions. We got an email this morning from Team E3DIY with a video of their E3 FLASHER confirming that they have downgraded an PS3 firmware 3.70 to 3.55 on a PlayStation 3 Slim. They have informed us that no soldering is required for the PS3 Slim consoles but is required for the phat and it works for NAND and NOR consoles. It's a simple one click and takes under five minute to downgrade. As per Team E3DIY, we have edited some of their wording to make it more understandable. E3DIY team has successfully downgraded 3.70 to 3.55 with E3 FLASHER! 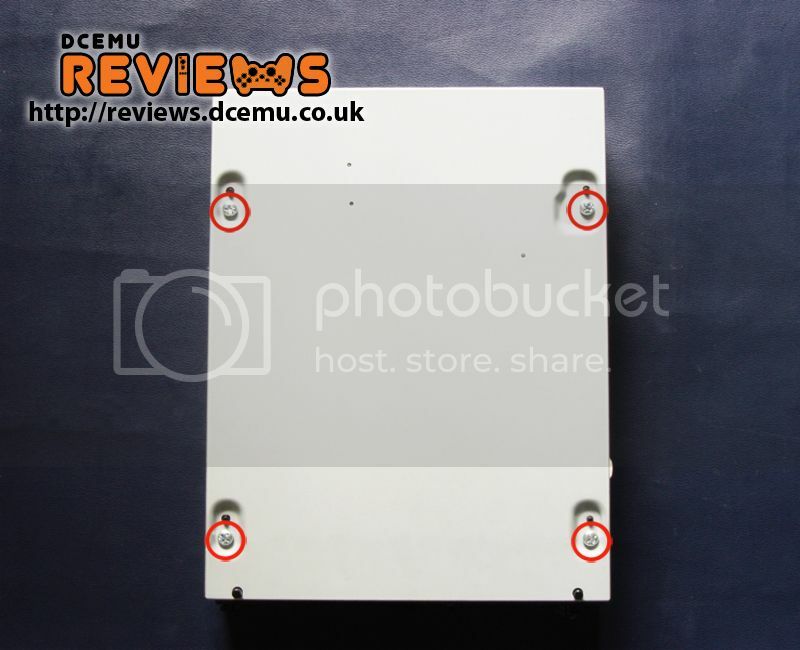 is very easy, all thanks to E3 FLASHER special design, 1key operation and NOR flash on board! We do not have any images of the E3 FLASHER because it is not released yet. We hope everyone understands. The official version should release next week, more video and picture will be made public at that time. PS: E3 FLASHER compatible with all NAND FLASH and NOR FLASH consoles. With Slim consoles, there is no need to solder wire but Fat console does. We'll have more information of pictures and pricing when it becomes available to us. 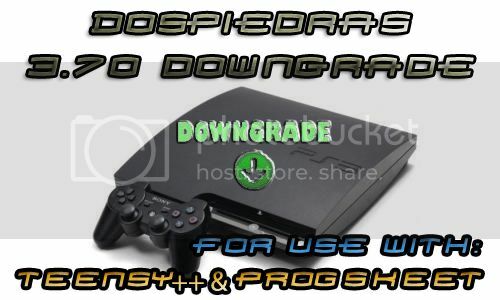 Spanish Developer dospiedras1973, has released his method to downgrade Slim PS3 Consoles on firmware 3.70. PS3Hax member mximposter was nice enough to correct and provide an actual Spanish-to-English translation. As a reminder, this works ONLY for PS3's with NOR. NAND models does not have a downgrade available...yet. To the whole channel darkps3 from irc-hispano.org for their support and many hours of testing we have hit hard mother****ers! METLDR : offset "810" size "E960"
It's been almost a year since the PS3 was blown wide open with PSGroove and jailbreak days with the likes of PSJailbreak, Teensy++, TI-84 calculators and many more. Since than, the scene has been a little quiet with a few advances here and there. One of the hottest and most affordable jailbreak dongles at the time was the E3Card. After Sony had released new firmwares that blocked the use of dongles, the E3 Team has been quiet. Recently, there have been advances in the mod scene and talks of downgrading from v3.70 Official Firmware. ProgSkeet [http://www.progskeet.com/] is supposed to be able to flash the NANDs and NORs of many PS3 consoles right out of the box. Of course, when there is a new product, teams and manufacturers jump on the bandwagon. Today, I received a email from the E3 Team which they have announced that they will be releasing the E3 Flasher. E3DIY Team did not give me much information but from the information that was provided, it seems that it is suppose to do the same as what ProgSkeet does. I guess we'll have to wait and see. E3 FLASHER, the world first flasher special for PS3, easier backup and downgrade, support dual boot, coming soon! Dual boot, choose booting from original bios or E3 bios. 3 save MODE, save bios to E3 nor flash, TF card or PC. NO harm for console, but can longer console life because of specially design. Compatible all slim and fat console, include latest 3000x version. Don't forget E3DIY team, which free service always It said they were studying BIOS, Let's wait and see what happens. AND please note the new E3 domain www.e3-tech.net, more details coming soon! PS: E3DIY team note 3.7 downgrade, so maybe E3 flasher will downgrade automatically, no need modify on PC. Thanks all guy whom contribute PS3 jailbreak. Yesterday, Sony announced that they have dropped the price of their 160GB and 320GB PlayStation 3 consoles to $249 and $299, respectively. That's a $50 price cut. Sony will also be releasing a inFamous 2 bundle. The bundle retails for $299 and includes a 320 GB PlayStation 3, a copy of inFAMOUS 2 and a 30-day membership to PlayStation Plus. I have some exciting news to share with you today. 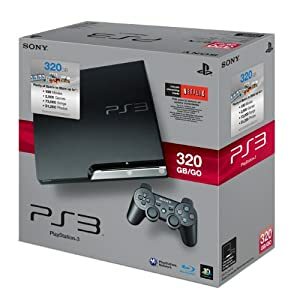 As many of you know, it has been nearly five years since the PS3 first came to the U.S. market with its built in Blu-ray player, integrated hard-drive, built-in wireless, and unmatched hi-def gaming. Today, more than 50 million PS3’s have been sold worldwide, more than 2,495 Blu-ray titles are available and the PS3’s expansive portfolio of games and video content on PlayStation Network exceeds 60,000 titles. While others in the space are losing steam, PlayStation 3 is gaining momentum and giving gamers everywhere more of what they want: an unparalleled line-up of exclusive games and access to the best in sports, movies and TV, all at a great value. Today, I believe that value becomes even more evident. I’m excited to share with you that effective immediately at retailers throughout North America, the 160 GB PS3 and the 320GB PS3 are now available for $249 and $299, respectively. In addition, a limited edition inFAMOUS 2 bundle is now available at participating retailers across North America. The bundle retails for $299 and includes a 320 GB PlayStation 3, a copy of inFAMOUS 2 and a 30-day membership to PlayStation Plus. The new price will make the PS3 more accessible than ever before, so there’s never been a better time to join PlayStation Nation. We know that while future-proof technology is important to you, content is still king — that’s why we continue to focus on bringing you exclusive “must have” titles that are unmatched by anything else on the market. With games like Resistance 3, Ratchet & Clank: All 4 One and one of my personal favorites, Uncharted 3, all on the horizon, there’s a lot of great entertainment in store for you. Of course, PS3 owners also have free access to PlayStation Network and its lineup of marquee content services for watching hi-def movies, TV and sporting events. Netflix. Hulu Plus. Vudu. MLB.TV. NHL Gamecenter. We have them all for you…and it just keeps getting better. 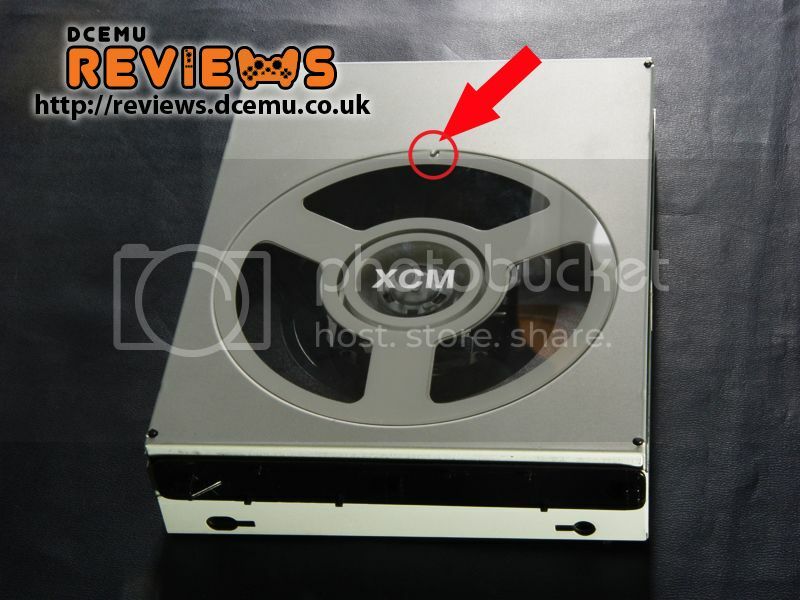 XCM 360 Slim DVD Drive Cover is a replacement DVD drive cover for the Xbox 360 Slim console. Combined with the XCM Black Knight Slim Replacement case (green, red or blue), you are able to see what game is inside the drive and watch the disc spin. Installation is easy. 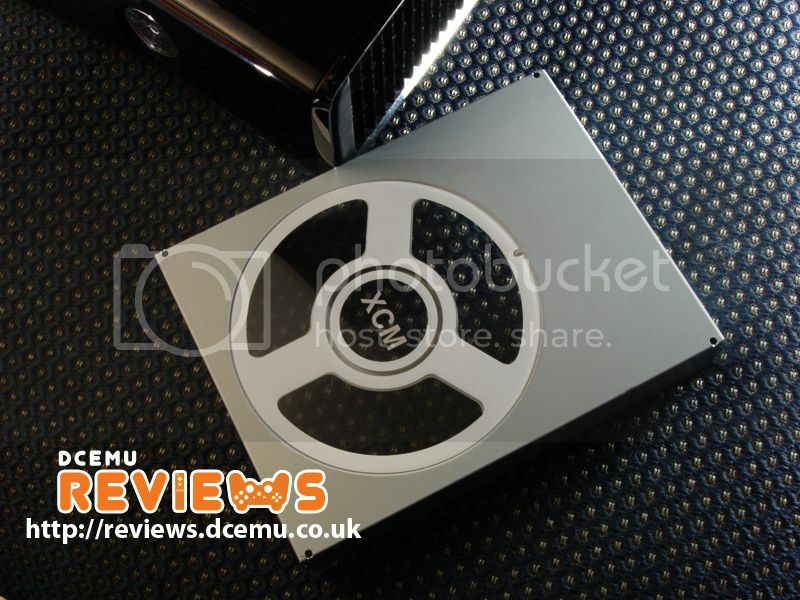 You'll will have a new look for your Xbox 360 Slim that will look cool. 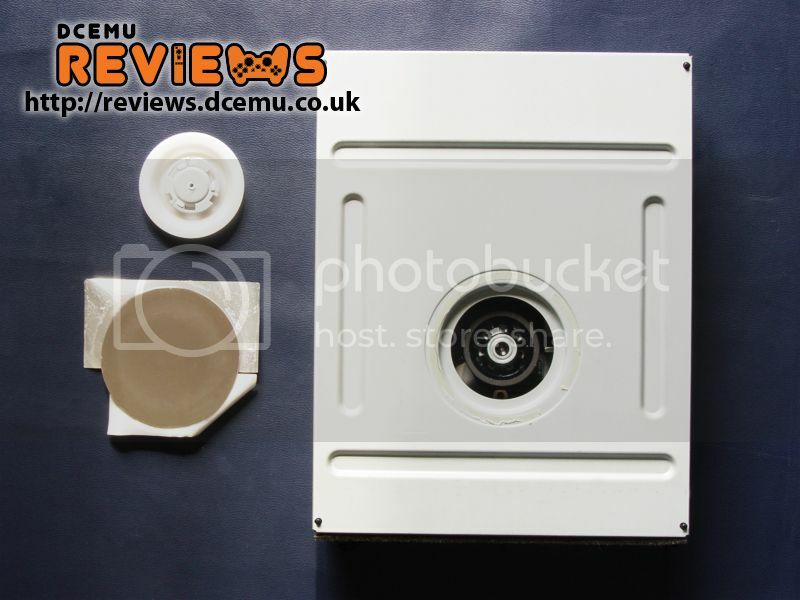 We bring to you an exclusive first look at the XCM 360 Slim DVD Drive Case along with instructions on how to replace the DVD-rom drive cover. 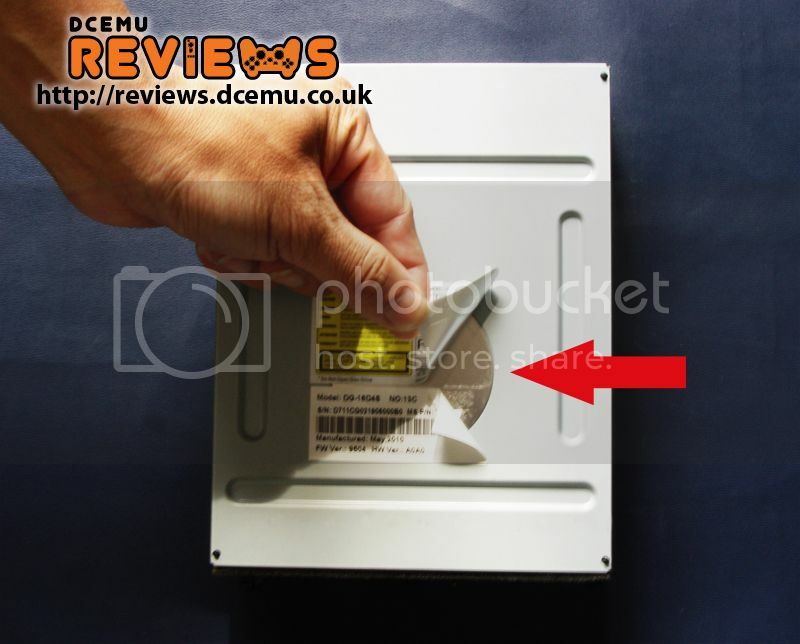 Follow the direction of the arrow to remove the sticker and open the iron plate. 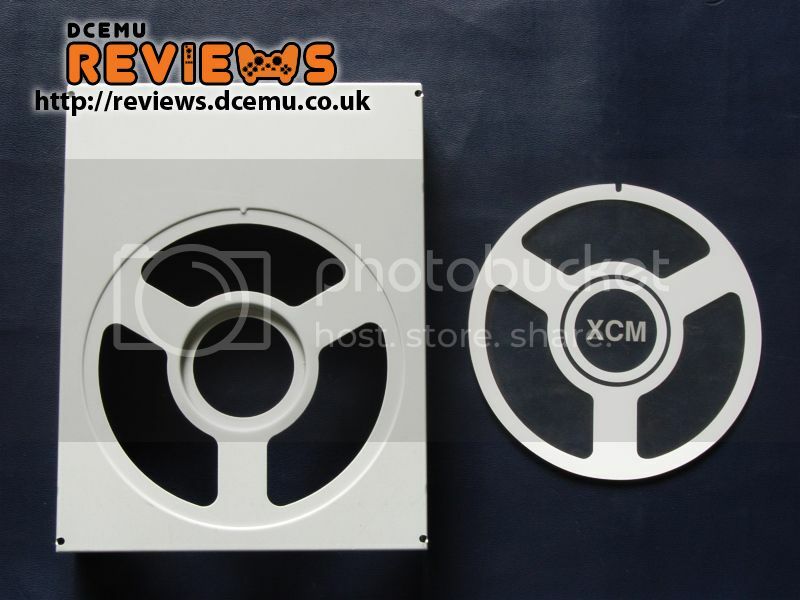 Left hand side is the XCM Slim metal cover, the right side is the plastic plate. Follow the arrow direction to place back the spindle cover. *A XCM X8 Unlock Kit will be required for dismantling of XCM Black Knight Slim Replacement case. Overview : To some, the Xbox 360™ controller is most arguably the best controller, but the button location may not be the perfect place for some games. In order to fix this, you may need to re-map some buttons that will suit your preference and gaming style. What if you're left handed and like to use the left LT as your shooting trigger and RT trigger for throwing grenades or even switching weapons? The XCM Re-Mapper allows you to re-map ANY button on a wired Xbox 360™ controller (except SELECT, START and Guide button) making gameplay that much easier, enjoyable and playable now. *You MUST use a wired Xbox 360™ controller. XCM Re-Mapper will NOT work with wireless Xbox 360 controller Play & Charge Kit. Quality/Usability : Connecting the XCM Re-Mapper is pretty straight forward. First connect the Official Xbox 360™ wired controller to the USB port of XCM Re-Mapper. Then plug the XCM Re-Mapper USB plug to the Xbox 360™ console. a. Press the “P” program button once. The program indicator will light up. The XCM Re-Mapper is now entering programming mode. The Manual On/Off switch function is temporarily non-functional. b. Now press the silver printed word “RT” button on the XCM Re-Mapper. The “RT” button indicator will light up in red. The program indicator will begin to blink. c. Press the yellow printed word “LT” button and the “LT” button indicator will light up in red. The program indicator will now stop blinking. d. If you want to remap other keys, follow the above steps “b” and “c” until you are done remapping. If you are done with your remapping of buttons, finally press the program button “P” once. All the indicator lights will turn off and this will exit the programming mode. Now you have the new setting included from the above steps; pressing the “RT” key = “LT” key. Note: the GUIDE key can not be programmed. By pressing on the program button “P”, some of the programmed buttons will be light up in red. On the XCM Re-Mapper, press the program button “P” again to exit out of programming mode. If you set the “LT” key to the “RT” key, “Y” key to the “X” key, when pressing on the program button “P”, the yellow printed words “LT”, “Y” and the silver printed words “RT”, “X”, will all be light up. When using the Official wired Xbox 360™ controller, if pressing the wired controller “RT” key, on the XCM Re-Mapper, the silver printed word “RT” and yellow printed word “LT” will both be light up in the color blue. If pressing the wired controller “X” key, on the XCM Re-Mapper, the silver printed word “X” and yellow printed word “Y” button indicator will both be light up in the color blue. a. If you want to clear a single setting, for instance: you had set “LT” key to replace the “RT” key, press the program button “P” once. The silver printed word “RT”, yellow printed word “LT” and program indicator will all be light up in red. Now press the silver printed word “RT” program button once. The program indicator will begin to blink, Press the silver printed “RT” program button again and the program indicator will stay red. The silver printed word “RT” and yellow printed word “LT” indicator will be off. Finally press the program button “P” to exit the programming mode. b. To clear all the re-mapped settings, simply press and hold the program button “P” until the program indicator starts to blink. Release the button and the program indicator lights will turn off after 3 seconds. All the re-mapped setting are now cleared and reverted back to default settings. What is nice about the XCM Re-Mapper is that you are able to update it if there is ever a new firmware released for it. You can check to see if there is any new firmwares or updates here. You can also find instructions on how to perform an update here. Conclusion : Overall, the XCM Re-Mapper for the Xbox 360 does what it says. Yes, Xbox 360 games allows you to remap buttons but not all games do and if they do, they may limit you to what can and can not be mapped. The XCM Re-Mapper gives you full reign of re-mapping the buttons on your controller except for the SELECT, START and Guide button. Unfortunately, in order to get this to work, you'll need a WIRED Xbox 360 controller. A Play and Charge Kit will not work. This seems to be a standard requirement for XCM adapters on Xbox 360 consoles even if it's just to activate the XCM adapter. 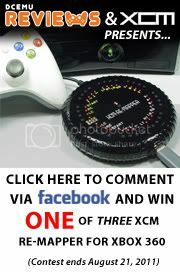 If you already have other XCM adapters for the Xbox 360, you won't need to buy a WIRED controller. Third party controllers such as MadCatz, HORI and others will work but not all will. OEM Microsoft controllers is your safest bet. Another down fall is that you are unable to use a wired headset. So if you don't have a wireless headset already, you'll have to shell out additional money.